This book, the second of two volumes, chronicles a highly personal journey, with plenty of loafing stops along the way, through the hills and hollows of Southern Appalachia, in search of the tastes that define and sustain the region’s people. Fred Sauceman introduces us to a German war bride pulling handmade pizzas out of her brick oven, tells the story of a Hollywood-type who felt the call of good cooking and the North Carolina mountains, and rubs elbows with a family whose store has it all, from sautéed scallops to boat rentals! 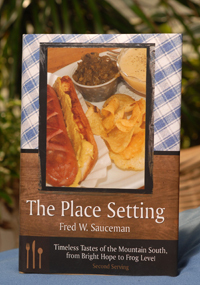 This serving of The Place Setting recounts the lives of three early television cooks, recalls a legendary hot dog vendor who ran for president, and profiles the most colorful and controversial grocer in the history of Southern Appalachia, known for luring customers by pitching chickens off store roofs. This book celebrates generations of people who have had the courage to go their own way, to cling to proven, sometimes even ancient, techniques, to remain loyal to age-old flavors despite the existence of easier, less laborious methods.